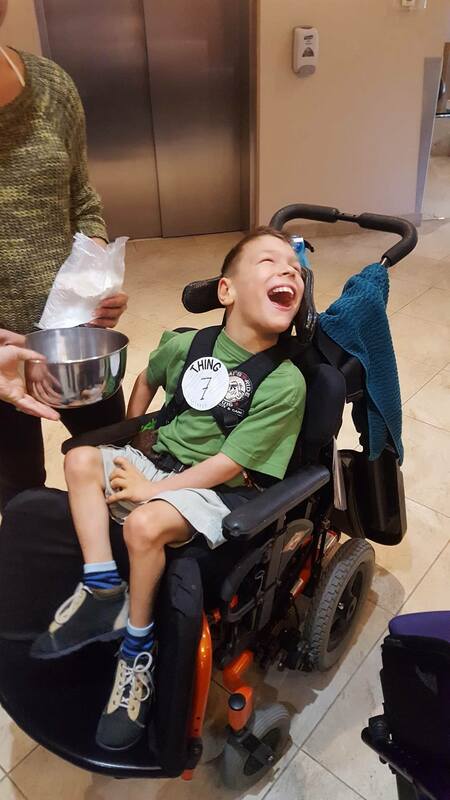 At Roger Neilson House’s summer camp, Campbell Labonte was just another child having a blast, taking part in games and activities and being surrounded by peers. It didn’t matter that he is non-verbal or in a wheelchair. For thousands of children, summer camp provides the opportunity to meet new friends, cut loose and experience outdoor sports. But mainstream camps are often not set up to cater to kids with complex medical needs. Joanna Labonte credits Roger Neilson House for identifying this gap and for including her son at the care facility’s inaugural camp in 2017. She says Campbell’s camp experience was remarkable given his daily challenges and social isolation. The nine-year-old has cerebral palsy and is deaf and blind. Campbell has been accessing services at Roger Neilson House for the past six years, including respite care and the pain and symptom management program. 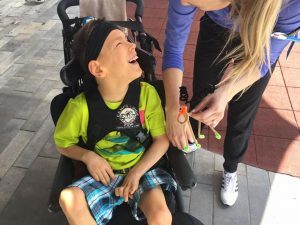 Jackie Davis, a registered practical nurse at Roger Neilson House since 2009, said the summer camp program was one of the best initiatives ever undertaken at the house. For many children who feel isolated and alone, being part of a community was a rewarding experience. Davis’s voice cracks with emotion when discussing the love she has for her job and the children who pass through the doors of pediatric palliative-care facility, located on the grounds of the Children’s Hospital of Eastern Ontario. Davis says some campers were able to bring a friend to share in the experience, while another mother got to see her daughter attend camp before passing away later this summer. Occasionally some children who were receiving care at the house would also join in for a camp activity. “I learn so much from the kids. You get a different perspective on what matters and living each day to the fullest. Everyone at Roger Neilson House is focused on that,” Davis says. Megan Wright, executive director of Roger Neilson House and director of palliative care for the Children’s Hospital of Eastern Ontario and the Ottawa Children’s Treatment Centre, was so thrilled with the success of the three-week camp that it is now an annual event. The camp runs from 9 a.m. to 3 p.m. and allows for six children per session. Activities include dodgeball, outings to a nearby wheelchair-accessible park, themed events with costumes, talent shows, face and body painting and singalongs. Recreational therapists Katt Brooks and Danielle Scarlett planned the itinerary in collaboration with nurse Davis in order to meet each child’s needs. 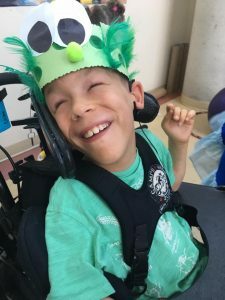 The aim of the Roger Neilson House recreation therapy program, which is made possible through the support of donations, is to ensure medically fragile children have the opportunity to experience normal childhood activities. “Danielle and Katt did a fabulous job of organizing all the activities. We were able to adjust schedules to meet everyone’s special requirements, meds, feeding and downtime. We couldn’t have done it without our amazing volunteers,” Davis says. Mac Hiltz has been a volunteer at Roger Neilson House for eight years. The retired social worker did a six-year stint at CHEO at the start of his career primarily working in the neurology department. With his experience helping families and children with difficult diagnoses, he was keen to give back to the community and is a family support worker and home volunteer for Roger Neilson House. “I was thrilled that the camp idea took hold. Volunteers are essential and supply much needed people power. My heart goes out to these families as there is no downtime – they are on 24 hours a day, seven days a week. Knowing that their child was at camp in a place they love must have felt like money falling out of the sky,” Hiltz says. Labonte says her son Campbell’s favourite activity is sensory play, while he also loves to go for a motorcycle ride with his father, Bert Labonte, who had a customized sidecar built for his son. On the second day of Campbell’s camp, Joanna recalls stopping by to attend a parent support group. When she arrived, she discovered a dance party taking place in the main lobby. “It wasn’t just the camp kids – the entire house and all the employees and volunteers were dancing in the foyer. It stopped me in my tracks. All kids deserve the chance to go to camp. It’s vital that children with complex needs do, too.